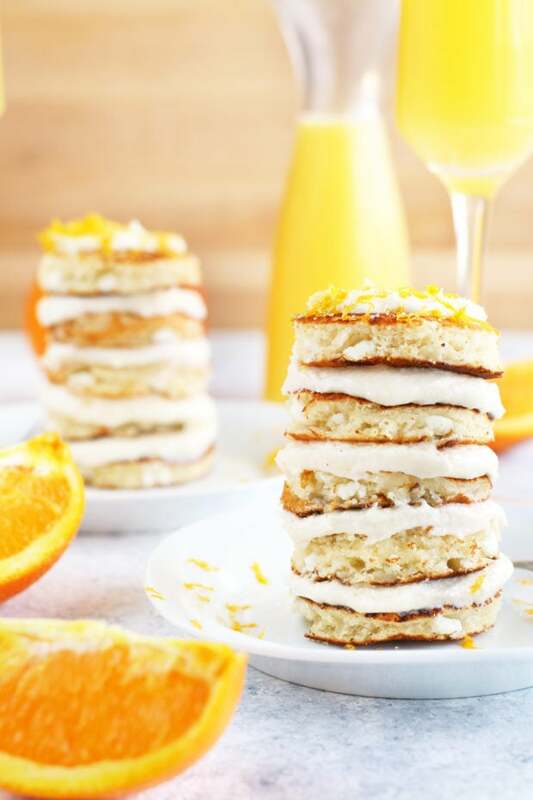 Mimosa Pancake Stacks are the ultimate way to up your brunch game this season. 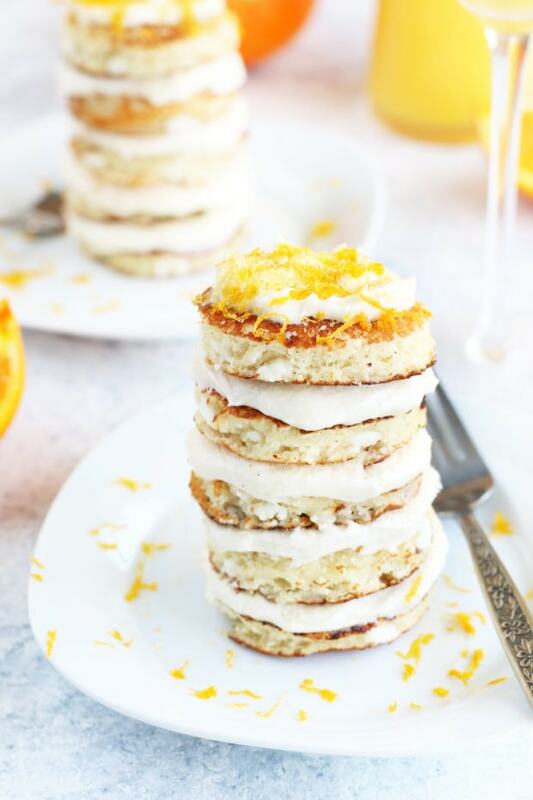 The pancakes are made with orange juice and white chocolate chips, then layered with creamy champagne frosting, making them like little stacks of dreamy orange champagne goodness. Pair them with mimosas and make the weekend COUNT. JUST LOOK AT THIS CUTENESS. I have been SO excited to share this recipe with you ever since my hairstylist and I came up with the idea weeks ago. She then described how this magical idea, when paired with some white chocolate chips, tasted just like an orange dreamsicle. “They are perfect for pairing with mimosas,” she said. “OMG what if I made them INTO mimosas? !” I exclaimed. I kid you not, this is just how it went down. I set to making them as soon as freaking possible and, my friends, they are even MORE magical than I imagined. The pancakes have the perfect amount of orange flavor from the orange juice and a hint of sweetness when you happen upon a white chocolate chip. 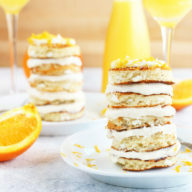 When you stack this up with a flavorful champagne frosting, you get the closest thing to a mimosas, without it actually being a mimosa! It’s perfect for pairing with mimosas, obviously. 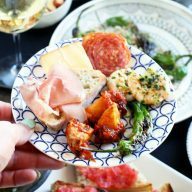 This is the thing to bust out for any and every brunch you host from now until forever. My honest favorite pancake mix? Krusteaz, Buttermilk Pancake Mix! 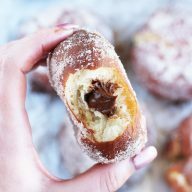 They are so fluffy and SO easy to make. Perfect for this recipe! Ateco Plain Edge Round Cutters in Graduated Sizes so you can cut these pancakes into the beautiful little stacks you see here. KitchenAid Pro 500 Series 10-Speed 5-Quart Stand Mixer for that lovely fluffy frosting! 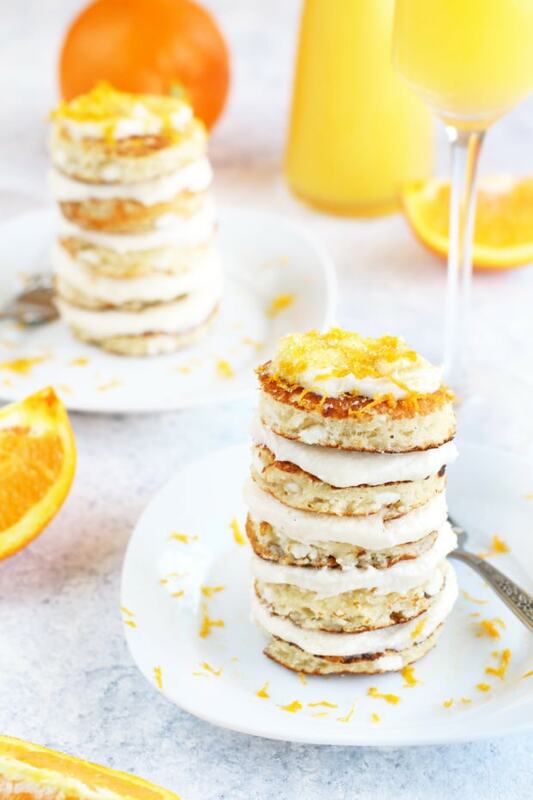 Pin this Mimosa Pancake Stacks recipe for later! 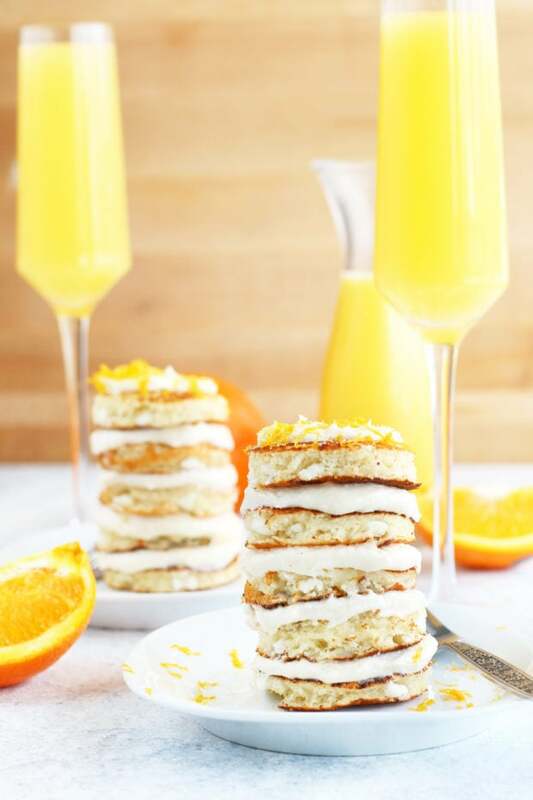 Orange and white chocolate pancakes are layered with champagne frosting for the perfect brunch dish! To make the frosting, add champagne to a small saucepan over medium-high heat. Bring to a boil and reduce to a simmer, until all that remains is approximately 1/4 cup, approximately 7 to 10 minutes. Set aside to cool completely. Add butter to the bowl of a stand mixer fitted with a whisk attachment. Beat until the butter is smooth and creamy, approximately 2 to 3 minutes. Add confectioners sugar and beat, starting on low and working up to high speed. Once fully incorporated, beat in 3 Tbsp reduced champagne and vanilla extract. Set aside. Make the pancakes according to the instructions on the package to make approximately 12 to 14 pancakes, replacing the amount of water the instructions call for with orange juice. If you are using my suggested brand, you will use 1 1/3 cups of orange juice instead of water for the 2 cups of pancake mix. Heat a griddle pan over medium-low heat. Lightly grease the pan with cooking spray or butter. Place 1/4 cup batter in mounds on the hot pan. Sprinkle a small handful of white chocolate chips on each pancake. Cook until golden brown on the bottom, approximately 1 minute. Flip and cook for another minute until golden brown. Remove from heat to a plate and keep warm. Once all the pancakes are made, cut out small circles, approximately 1 1/2 to 2-inches in diameter. 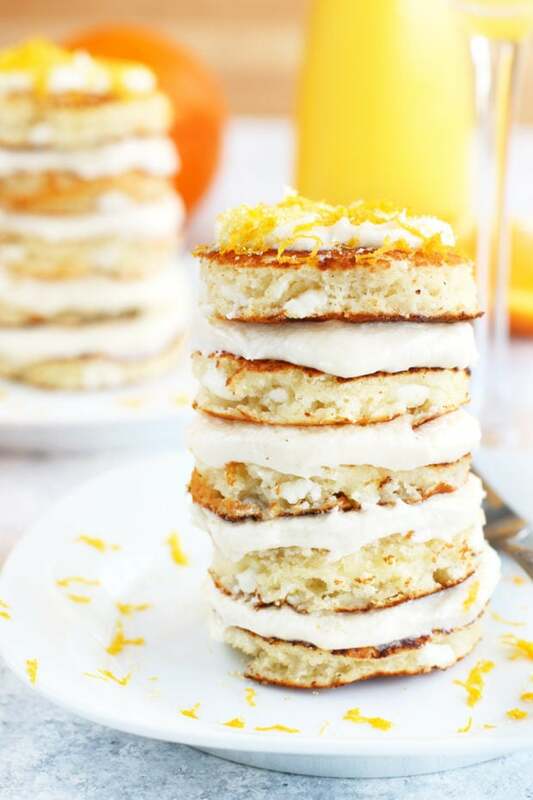 Stack the pancake slices, layering them with champagne frosting between each pancake round. 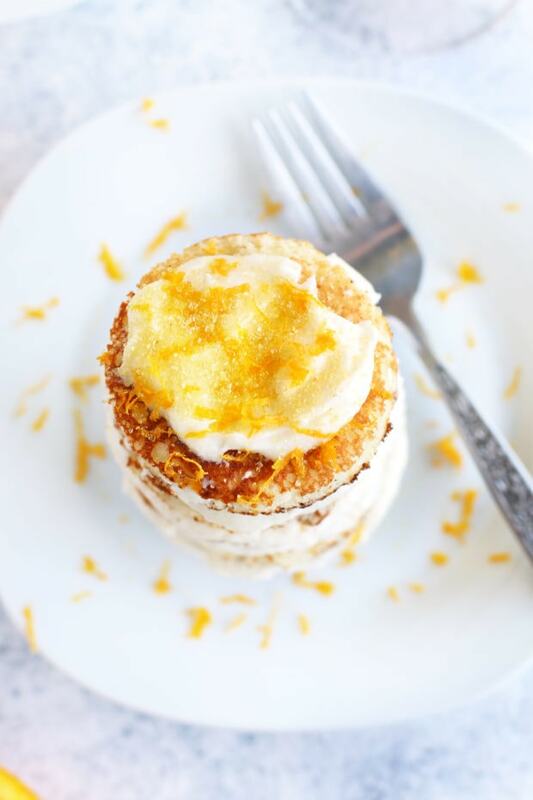 Top with a dollop of frosting, a sprinkle of fresh orange zest and some gold sugar sprinkles. 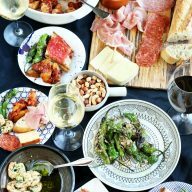 Serve immediately, ideally with mimosas!